he Lowepro Adventura 120 Shoulder Bag (Black) is a 600 denier polyester and 600 denier ripstop, lightweight, streamlined bag with a fully padded interior and tricot lining. 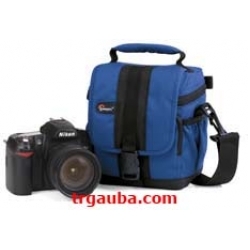 It is designed to carry a digital SLR camera body with an attached lens, a high optical zoom compact camera, or a compact camcorder and accessories for each. The rainflap lid covers zippered main section and protects contents. The interior has a high-visibility burnt orange color and removable dividers. The Adventura 120 has a zippered front pocket with 2 interior pockets for memory cards and small accessories, a zippered front exterior pocket with 2 interior pockets, 2 pleated side pockets and a slip pocket in back for storing manuals, maps or a notepad. The bag is carried by a padded grab handle or a removable, adjustable shoulder strap with a non-slip patch and snap hooks.